Out of all of my books, the one by far that has gone through the biggest identity crisis is Restless Spirits. 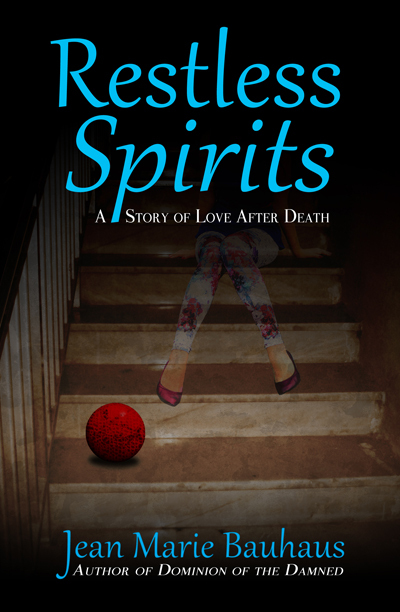 It started out as a paranormal fantasy novel, although it’s kind of chick lit, written as it is from the first person POV of a twenty-something woman trying to sort out her afterlife. The cover had a dreamy looking barefoot girl in a white dress beckoning to the reader. It did a pretty decent job of getting the romance across, but not much else — not the touches of humor, and certainly not the more frightening dark fantasy aspects that verge on horror. So then I tried to fix it. I kept the dreamy girl, and added a background with a spooky-looking house. It had plenty of atmosphere, but it was starting to remind me more of a Gothic romance, and that was the wrong vibe. Closer — I guess — but no cigar. Then when I did my Indiegogo campaign for Dominion of the Damned, I sold some packages that included autographed copies of both novels. That’s how some of my guy friends ended up reading Restless Spirits, and they told me that they really enjoyed it, but would never have picked it up on its own because of the cover. Oh noes! My girly Gothic ghost cover was scaring away the dudes! What to do? 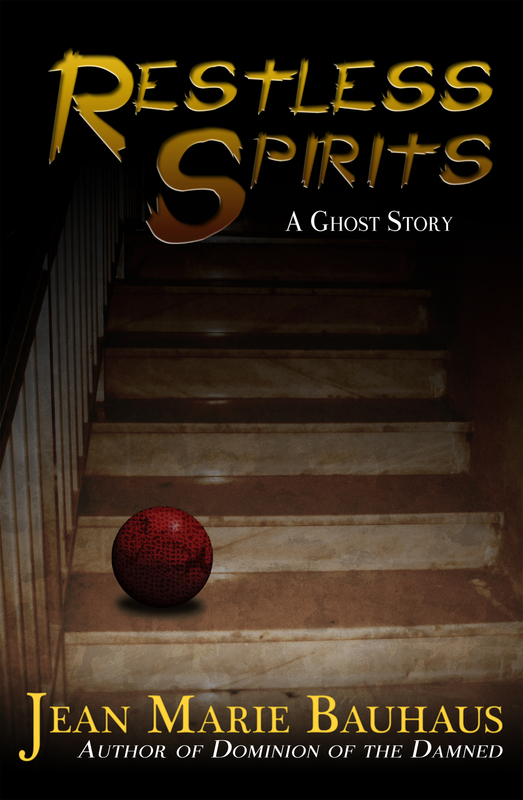 What I did was another cover makeover, this time with no chicks — just a spooky staircase and a creepy child’s ball that features prominently in the story. This new cover did a very excellent job of conveying the dark and creepy elements… and not much else. Sales plummeted, that’s what. Guys still weren’t interested, and now neither were the gals. Le sigh. I let this go on for a while, mainly because as a graphic designer I was pretty proud of that cover. But it just wasn’t doing what covers are supposed to do — i.e., sell books. At this point I began to realize that not only was this book having an identity crisis as to what genre it wanted to be, but I myself was having a bit of an identity crisis as to what kind of writer I want to be known as. As you may know, I’ve been going through a bit of a horror and dark fantasy phase lately, but I also still enjoy a good romance. But despite knowing and having the utmost respect and admiration for a number of romance novelists, and despite having written plenty of romance myself, something in me has been really resistant to the idea of being labeled a romance novelist myself. I realized I’d been calling this book everything else in my marketing efforts — paranormal fantasy, dark fantasy, romantic fantasy; apparently I’ve got it stuck in my head that I’m a fantasy author, dammit. Anyway, this is stuff I’m still sorting out in my head, but to cut to the chase — a couple of weeks ago I turned to my readers on Facebook and asked what genre they think this book is. The unanimous answer? Paranormal romance. So there you have it. Lesson learned: genre is a marketing label. Know your audience and what sort of thing grabs them. Trying to appeal to everybody is death to book sales.